In March 1947, an Alsatian patrol dog with the 13th Parachute Battalion received the People’s Dispensary for Sick Animals (PDSA) Dickin Medal for service in the Second World War. In addition to patrol duties, Bing, or Brian as he was known in peacetime, was ‘a fully-qualified Paratrooper’ and joined the battalion when they jumped over Normandy on D Day: 6 June 1944. Seventy years later, the anniversary of D Day offers an opportunity to reflect on the ways in which Bing and other dogs contributed to the British war effort during and after the Second World War. Since the first Dickin Medal in 1943, the PDSA has conferred the award on 65 animals, including dogs, pigeons, horses and a cat. Many of those animals, including a carrier pigeon which relayed one of the first reports on Allied operations on D Day, earned the award for work carried out during the Second World War. During that conflict, dogs were recruited and trained by the British Armed Forces to serve as guards and on patrol; the Second World War also saw the first use of mine detection dogs in the British Army. In total during the war, the Army and Ministry of Aircraft Production employed some 3,500 dogs for guard, patrol and mine detection duties. Prior to the outbreak of war in 1939, the Home Office turned to a dog to locate multiple holes in a series of buried cables at a newly constructed Post Office receiving station in southeast England. When functioning properly, the cables and the several antennae to which they were linked, allowed the station to receive long-distance radio signals. A Labrador called Rex was supplied by H.S. Lloyd, a civilian dog trainer who became the Chief Instructor of the Army’s War Dogs Training School upon its establishment in 1942. Rex located fourteen holes in the cables, which were buried three feet below the surface. Encouraged by Rex’s performance, the Army began training dogs at the school to detect non-metallic mines which had proven problematic for detectors. Although trainers believed that mine detection dogs relied on scent to locate mines, a British military study in 1947 found ‘no clear indication by what sense the dog detects the mines.’ Nonetheless, using food as a reward, trainers taught dogs to locate mines laid above, and eventually, below ground. The dogs alerted handlers to mines by pointing or sitting. 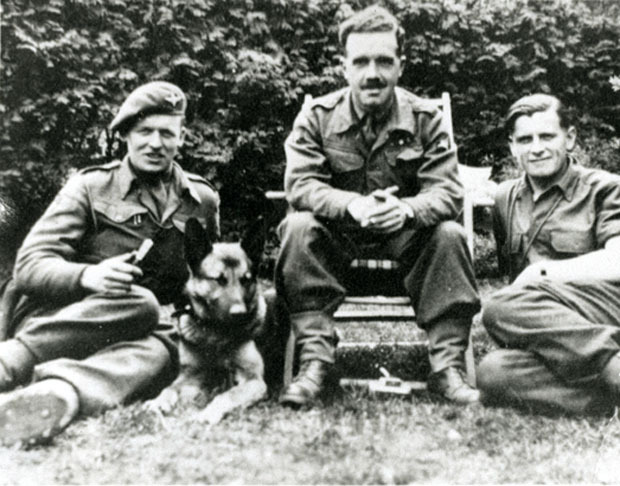 Following the Allied invasion of Normandy, four Dog Platoons were deployed to northwest Europe, where they worked with Royal Engineers to locate landmines. In addition to being able to locate non-metallic mines, the dogs were found to be ‘the quickest method of locating minefields’ in northwest Europe. Some dogs, including Rob of the Special Air Service, were equipped with parachutes to participate in airborne landings. Rob, a collie believed to have completed more than 20 jumps, was awarded the Dickin Medal for carrying out reconnaissance patrols in North Africa and Europe. Experience gained with mine detection dogs during the Second World War paved the way for the use of canines to locate other objects. In 1946, for example, the British Army employed detection dogs in Palestine to seek out buried arms which detectors failed to discover. Five years later, mine detection dogs were deployed to Korea to aid British troops in the discovery of enemy minefields. The dissolution of the British Empire in the latter half of the twentieth century, as well as the wars in Iraq and Afghanistan in the early twenty-first century, provided further opportunities for the use of military dogs. During the 1950s, the British Army established guard dog units in Hong Kong, Singapore and Cyprus. The Malayan Emergency saw the transport of tracker dogs by helicopter. Once on the ground, tracker dogs assisted the British Army and Royal Air Force (RAF) Police in the pursuit of guerrilla forces in the Malayan jungle. Around the same time, dogs were also employed by the Army and RAF Police during the conflict in Kenya. In an effort to help quell the Mau Mau Uprising, a dog training facility was established in Nanyuki, where canines were trained for guard, patrol and tracking duties. Furthermore, detection dogs were utilised on a large scale in Northern Ireland during the late twentieth and early twenty-first centuries. At present, the duties of military working dogs range from the detection of explosives, weapons and drugs to the defence of military personnel and property. As of June 2011, the British Armed Forces included more than 600 dogs, and the Army’s 1st Military Working Regiment, based in Germany, employs around 200 canines and 280 personnel. Prior to active duty with the British Army, Royal Air Force or Royal Military Police, all dogs undergo training at the Defence Animal Centre in Melton Mowbray. In May 2014, British Army dog Sasha became the 29th canine to receive the Dickin Medal. The Labrador and her handler, Lance Corporal Kenneth Rowe, were killed nearly six years ago whilst on duty in Afghanistan. Almost seventy years after Bing was awarded the Dickin Medal for jumping over Normandy, Sasha’s posthumous award reflects the continued usefulness of the military working dog, which seems likely to remain a mainstay of the British Armed Forces in the immediate, and perhaps, distant future. Copyright Kimberly Brice O'Donnell. This article was produced as part of the No10 Guest Historian series, coordinated by History & Policy. Brave dogs all - but the mash-up at the start is a disservice to two gallant WW2 dogs..
'Bing’ (War-Dog 2738/6218) from Rochester, Kent, who was in action in Normandy and later in NW Europe ending up on the Baltic, never received a medal. Although recommended for an award, he was disbarred as being government property (and thus fated to be destroyed when no longer militarily useful). He is buried in Sennelager. 'Brian' (War-Dog 2720/6871), from Loughborough, Leics, was another German Shepherd who served like Bing with 13 (Lancashire) Battalion, Parachute Regiment on and after D-Day, June 1944 - then became a POW guard dog. Having been returned to his civilian owner in 1946, he was first awarded the RSPCA's For Valour medallion and then the PDSA's Dickin Medal and became rather famous. He is buried in the PDSA animal cemetery, Ilford. They were entirely different dogs - as War Office AV&RS records in The National Archives show. Their bravery should be properly recognised at this high governmental level of record.. Thank you for your comment, Christy. There is some confusion surrounding the dogs Bing and Brian. It seems that the 13th Parachute Battalion may have employed two 'paradogs' called Bing, one of which was known as Brian in peacetime. I am aware of the War Office record to which you refer. It lists an Alsatian called Brian (2720/6871) owned by Miss B. Fetch of Loughborough. Fetch, however, has been identified as the owner of an Alsatian called Bing. The Airborne Assault Archive maintains that the Bing which was awarded the Dickin Medal was owned by Fetch and was known as Brian before the war. Thank you Kimberly. We will have to lure you over into the Brian and Bing being two entirely different dogs side of things and end this canine confusion. It's easily done.